Coming up on his 25th year with the Central Utah Water Conservancy District, General Manager and CEO Gene Shawcroft took the reins at a crucial time in the organization’s quest. The system’s infrastructure is in need of costly updates, project funding is dwindling and Utah’s population is booming, putting increased pressure on the District to provide safe, reliable water. 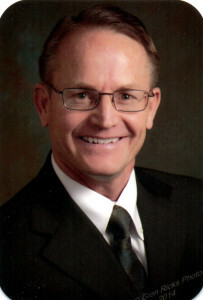 But he came to the job well equipped, with bachelor’s and master’s degrees in civil engineering from Brigham Young University and two decades of working his way through the District’s ranks. Here’s a look at the CUWCD’s challenges and accomplishments, seen through his eyes. Coming from a civil engineering background, how important do you feel the CUWCD’s infrastructure is in providing usable water to your region? Without the infrastructure of the Central Utah Project (CUP) and the associated Central Utah Water Conservancy District (CUWCD) facilities, one of two things would be the case. The Wasatch Front, from Santaquin in South Utah County on the south end to Salt Lake City on the north end, would be much different. Either the growth (population as well as industry and business) would have been limited to about what it was in the mid-1980s, or our landscapes would be desert landscapes similar to what is seen in Arizona or New Mexico. The CUP provides over 30% of the water used in Salt Lake County and will yet provide additional water as the demand increases. Most of the water used for development in Salt Lake County since the mid-1980s has come from the CUP, and future development for the next 30 to 40 years will come from the CUWCD. Other areas of the District such as Wasatch County and the Uintah Basin would not have an adequate water supply to sustain the agricultural economy they have currently. With new federal legislation setting up a degree of funding to states, the focus on infrastructure seems to be in the forefront. How has your background prepared you for that challenge? The construction of the CUP has been underway for about 50 years. Federal funds have been used to finance the majority of the construction. Federal legislation, agreements and Congressional authorization have been in place over this period of time to finance the Federal CUP. The recent national awareness of deteriorating infrastructure has only increased attention for funding needs. However, this increased awareness has had little impact on us or our project from a national perspective. Within the State of Utah, though, the increased awareness of infrastructure replacement has helped to begin the process of financing the tremendous costs of maintaining the systems we have in place to deliver the water currently being used. What in your 20-plus years with CUWCD has helped you lead the organization through this? The District has been fortunate, and I’d even say blessed, to have the trustees, staff and consultants that we have had. Among these people I have found many mentors. The District has devised some incredibly unique relationships, developed creative solutions and overcome challenges that many thought would not be possible. I have been in a front-row seat as I have observed, and to a small degree participated, in this one-of-a-kind, once-in-a-lifetime experience. Repeating the past isn’t the solution to the future. Hopefully, the lessons of observing this creative process to tackle and struggle with changing challenges by using available minds and talents of many will continue. The course the District is charting is very positive, and maintaining that course will be the emphasis of the future. How has working through ranks changed your view on the best way to achieve success? Fortunately, I have had the opportunity to see the District from many angles. Prior to becoming a District employee, I watched the progress of the CUWCD and noted its accomplishments. Once I became an employee, opportunities to become acquainted with the vast nature of the project and the incredible skill and dedication of staff were readily available. Knowing how things are built, who built them and how they are maintained has been very helpful to appreciate the effort necessary to deliver a safe and dependable water supply. Most take for granted the blessing of this wonderful resource. However, the employees of the District know how critical their function is to the overall success of the District. Knowing the importance of each function creates an environment that causes each employee to contribute in very meaningful ways to the District’s success. Success comes from each employee being successful. What was the feeling in August when the Colorado River Basin finally connected with the Great Basin under your watch? As valves were opened for the first time, allowing water from the Colorado River Basin to flow through CUP facilities directly to the Provo River, thoughts turned to the many people who had a hand in the project. There is no way to know or understand the number of individuals—engineers, elected officials, contractors, financiers, advisers and members of the general public—who spent years of their lives making this happen. Many careers of many people were invested in the project. Lives of many in Utah will be impacted for many future generations by having this safe and reliable water supply. Unfortunately, many of these people will never know what it took to make this a reality. How important are these projects to the CUWCD’s mission? Large-scale projects that deliver safe and reliable water for generations is what the District is all about. With completion of each of these projects, there is an incredible sense of accomplishment felt by trustees, staff and others involved. Only those who have completed such projects understand the nature and scope of the challenges involved. I’m grateful to be associated with a group of people who have and have had the courage and tenacity to put others’ interests ahead of their own to sacrifice for future generations. Many involved in these long-term projects never live to see their completion, much less see them in operation and the community that are allowed to flourish. Our mission from behind the scenes is to provide an essential resource that provides a place for jobs to be created so our children and grandchildren have a place to live, work and enjoy life. What do you see as the biggest challenge in coming years? People will continue to use and want water, which is a good thing. Use per person will decrease, which is also a good thing. Future challenges will be multiple. However, perhaps the biggest will be that people will not appreciate the value of water and become indifferent about its importance until there is a scarcity. Then it will be very expensive financially and environmentally to catch up with demand. Generating a constructive public interest in maintaining current water supplies and developing future water supplies will be a challenge. Opportunities to fund future expenditures need to be established now to avoid this inevitable crisis if left unfunded. A lot of factors come into play, from climate change to population growth. What is going to keep the water supply in step with Utah’s consumption? There are really four significant factors that bring us to a crossroad. Some we are familiar with, and some are new. For the first time, really, as a country, and certainly as a state and as local communities, we are facing the fact that our existing water infrastructure needs or will need to be replaced in the near future. Climate change as it is being defined by the scientific community creates a new pressure on our limited water supply. Dwindling or non-existing federal dollars used to finance large water projects such as the CUP is a reality of the last few years, and it appears that will continue into the foreseeable future. Although growth pressures continue, it is a factor that has been present for years. The short number of years over which our state’s population is projected to double, however, is alarming. With these tremendous pressures and the length of time it takes to develop additional water supplies, we must continue the practices of our predecessors to plan and sacrifice for the future. We can’t stop because we’re OK today. We must continue to consider all available resources to maintain current supplies and develop future ones. As it has in the past, new technology yet to be developed will play a role in lowering our use per person. Conservation practices will become a part of our daily lives. Conservation will not, however, eliminate the need for future supplies. Creativity and ingenuity of the past will be tested again in new ways to provide for these future supplies. Dedicated individuals will be called upon, as they have been called upon in the past, to come up with future needs. Now is not the time to take our foot off the gas pedal. Has that fluency in Portuguese come in handy on occasion? Com certeza! (Definitely!) I have given a couple of water presentations over the years in Portuguese. Can’t say that it was pretty.